My fraternity, Sigma Phi Epsilon, had the distinction of owning two adjacent houses at the corner of George Street and Bishop Place during my years at Rutgers. Through some ironic stroke of fate, I became the “House Manager” for one year meaning I was, in effect, the “super” for both houses. Normally that meant that I changed the light bulbs, fixed the overflowing toilets, ordered the heating oil and, in general, kept both houses habitable for about 40 males who had not long ago had been kept in check by their mothers at least when it came to their immediate living conditions. That I was responsible for household “neatness” was the source of never-ending disdain by my sister who saw the irony of that fact, and the enmity of my “brothers” evident when I did a monthly room check and levied fines for any “extreme disgust factor” which could be applied to their abodes. That’s not to say that I hadn’t any transgressions of my own to admit to such as when I left about 40 pounds of beef in the basement freezer that had been unplugged for the summer. 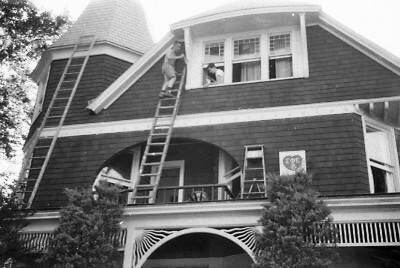 That fall, when I opened the house, I learned for the first time that I could hold my breath for nearly two minutes when pressed to do so. A recent death in my immediate family has had me rummaging through old photographs to share with family members. In doing that task I came across a roll of negatives that I hadn’t looked at in nearly sixty years. When I started loading them into my scanner, I was suddenly looking at my fraternity brothers in action and realized that everyone in those photos (with the exception of our house mother Mrs. Hall) was about the same age as are three of my grandchildren today! And Mrs. Hall was about the same age as you and I are now! Imagining my grandchildren living on their own with only my guidance to control them is somewhat disconcerting. But maybe I’m misjudging them, and fortunately Mrs. Hall wasn’t me. When asked about my years at Rutgers my memories are dominated by just two phases of those times, and one of them isn’t my time being educated in the classroom. I remember the times on the lacrosse team and life in the fraternity. Being on the lacrosse team wasn’t really very different from the times I spent on sports teams in high school or even grammar school. But in the fraternity we were, for the first time, on our own -- living an “adult” life with our own self-imposed parameters. For me it was a liberating experience that both confirmed my independence as an individual and proved that everything I had thought about my social and intellectual abilities just might be true or close to it. Although I grew up less than ten miles from Rutgers and lived there still when I entered college, I was able to convince my parents that living on campus was far better than taking a bus to and from New Brunswick every day as I had done all through high school. I spent a second semester in Frelinghuysen and then three years living in the fraternity house. I can’t say with certainty that fraternity life in general is a good thing in 2019, but I think it was good for me back then. It certainly was an adventure. And it generated enough anecdotes to fill my life for the last 60 years. 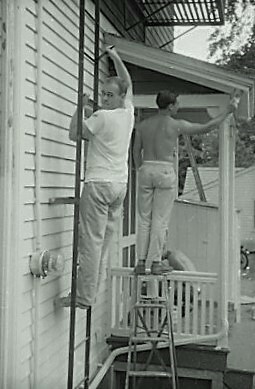 Looking at those photos (and two are shown here) I see my fraternity brothers at work on a task that I, the house manager, must have assigned them – painting both houses to ready them for the coming school year. The safety rules I must have applied to that task show that I wasn’t, in fact, as mature as I might have thought myself being. At least no one “died for Dear Old Rutgers” while painting the Sig Ep houses. That would have been worse than the liquefied 40 pounds of beef I breathlessly scooped out one fall. That I could motivate or at least direct these young men to do what I have never been able to induce my son to do ever says I must have developed some maturity deep down inside even then. I’d love to hear their side of the story – maybe.